Porsche is currently exhibiting the 911 R at the International Motor Show in Geneva. Its ancestor appeared just under 40 years ago: a 210 hp race car approved for road use. We take a look back. It all began with a test report. Porsche employee Rolf Wütherich summarised the goal of the 911 R project in the fall of 1966: “A vehicle is to be built that is superior to the current competition in its power-to-weight ratio.” The technician, who would later became known as the race car mechanic for James Dean, conscientiously performs the related calculations. With an unladen weight of 800 kg and 210 hp of engine power, the car’s power-to-weight ratio was less than 4 kg per hp – 1.5 kg lower than that of the competition at the time. With such a vehicle, Porsche could dominate in GT sport, just as the 356 with a Carrera engine had done a decade earlier. This would be an enormous task, because progress of the 911 in motorsport came rather slow at first. After a factory team raced a slightly modified 911 at the Monte Carlo Rally in 1965, only individuals raced the 911 at GT races. The successes of private car owner Eberhard Mahle, in particular, at the European Hill Climb Championship, made the people in Zuffenhausen give more thought to the idea of developing a purebred race car version of the 911. In October 1966, a first lightweight test car of the type 911 R (R = Racing) was built, and it was tested on the new skid pad in Weissach and on the race course in Hockenheim. The performance data that was measured showed the great potential of this idea: With a lap time of 2 min. 17.5 sec., the 911 R was just 12 seconds slower than the record time, which was set by a Porsche 906 Carrera 6. For a GT car, this lap time is an excellent figure, because the type 906 was a genuine Group 4 race car in the sports car world championship. Along with low vehicle weight, it was the engine of the 911 R that delivered excellent driving performance. The car was powered by a six-cylinder flat engine, very similar to the one that was also used in the Porsche 906 Carrera 6. The type 901/22 race engine, which was equipped with dual ignition, titanium connecting rods and large triple carburettors, had a power output of 210 hp at 8,000 rpm. With this engine, the 911 R accelerated from zero to 100 km/h in 5.9 seconds and could cover a distance of one kilometre from a standstill in just 24.2 seconds – one second faster than a Porsche 904 Carrera GTS and a full 5 seconds faster than an Alfa Romeo GTA. In 1967, four prototypes of the 911 R were built, in whose construction all of the capabilities of the homologation formula for motorsport were exploited. Built under the motto of maximum lightweight design, the front lid, front wings, doors and bumpers were made of glass fibre reinforced polymer. These glass fibre reinforced parts are produced by the Stuttgart-based company Karl Baur. The weight reductions affect nearly all of the car’s parts. The windscreen was made of thin 4-mm glass, and the other windows were 2-mm thick plexiglas. Whatever was not absolutely necessary was left out. Purism in its purist form. In the trimmed-down interior, for instance, two of the five instruments, the ashtrays and cigarette lighters and front passenger’s sun visor were removed. The crank mechanism for the side windows was omitted, and plain leather straps were used for this function. Compared to a standard production 911 S – which is anything but a heavyweight at 1030 kg – the total weight reduction amounted to 230 kg. However, Porsche was cautious regarding its decision on production volume for the first genuine 911 race sports car. With an estimated sales price of 45,000 DM, a 911 R is nearly twice as expensive as a regular 911 S. Considering the economic recession that was making itself felt in the mid-1960s, the volume of 500 vehicles required for a GT homologation was a very remote possibility. 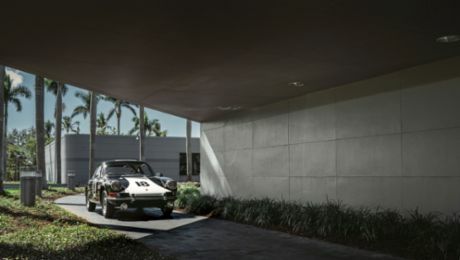 In May 1967, Porsche management therefore decided to produce just 19 vehicles of the type 911 R. 15 of them would be sold to individual customers, while the remaining four would remain at the company for motorsport competition. Since homologation as a regular Gran Tourismo was impossible, the factory team only entered races in the somewhat exotic 2-litre GT prototype class (GTP). The 911 R made its racing debut in July 1967 at the “Circuito del Mugello”, which still counted as a world championship series race in that year. Finishing after two Porsche 910 race cars, drivers Vic Elford and Gijs van Lennep took an excellent third place overall in their 911 R. Not only had they left the entire Alfa fleet behind them; they also beat a Ford GT40 Mk III, which took fourth place. At the “Marathon de la Route” endurance race in 1967, drivers Hans Herrmann, Vic Elford and Jochen Neerpasch went to the start. After 84 hours on the Nürburgring, they drove to victory in a 911 R equipped with a semi-automatic Sportomatic transmission. In September 1967, Gerhard Mitter took first place in the category of sports cars up to 2 litres in displacement at the “ADAC Hill Climb Trophy” race in the “Swabian Alps”. The car also competed in other races in rally motorsport. For instance, Vic Elford won the “Rallye Coupe des Alpes” in 1967; in 1968 the 911 R repeated its podium placement in Mugello, and in 1969 Gérard Larrousse drove to first place at the “Rallye Neige et Glace”. These successes were followed in the fall by another overall victory by Larrousse at the “Tour de Corse”. First place at the “Tour de France” in 1969, also with Gérard Larrousse at the wheel, would be the most significant racing success of a 911 R ever. In the fall of 1967, a 911 R attracted a lot of attention for its unusual record setting drive. Four Swiss race car drivers, Jo Siffert, Dieter Spoerry, Rico Steinemann and Charles Vögele, set out to break several endurance world records in Monza. When their Porsche 606 Carrera 6 proved to be unsuitable for the very steep drives, the Porsche factory quickly sent a 911 R as a substitute vehicle. Not only was the car driven from Zuffenhausen to Monza on its own wheels. The engine already had 100 hours on the dynamometer by then as well. The only preparation necessary was to change the gear ratios. To preserve the gear wheel of the highest gear for 96 hours at full throttle, the 4th and 5th gears were equipped with an identical high-speed gear ratio. The record drive took place in early November 1967, and it lasted three days and three nights. After 20,000 km at full throttle, five new world records and 14 international class records had been set – all at an average speed of more than 200 km/h. Power 154 kW (210 hp) at 8,000 rpm. Pia Beckmann has realised her car ownership dreams early in life: a 928 S4.